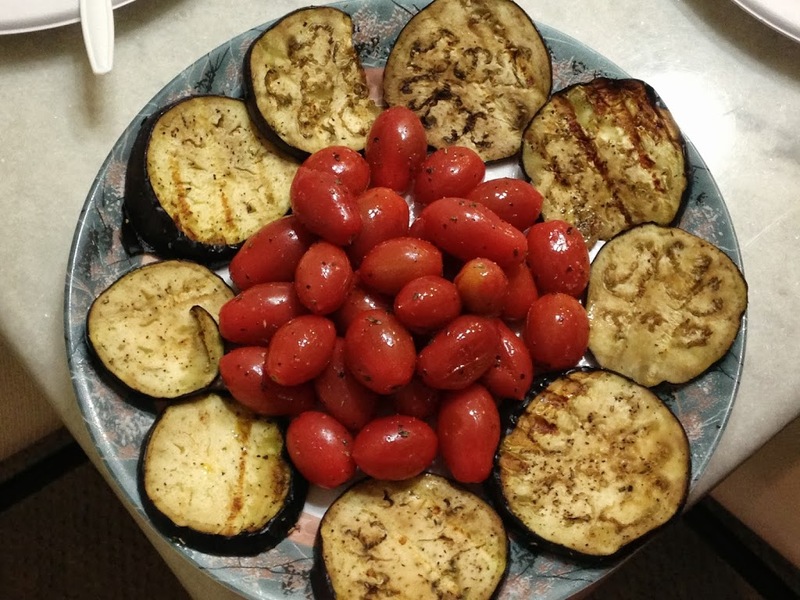 Last Saturday, for an iftari party, I quickly assembled a plate of grilled eggplant and roasted cherry tomatoes. My dad had been asking me to make something with the eggplant and I had some fresh cherry tomatoes from my aunt’s backyard vegetable garden. They turned out great, and I especially loved the seasoned tomatoes straight out of the oven! I sliced the eggplant and seasoned it with a little oil, salt, pepper, garlic, paprika, cayenne pepper, and rosemary. Grilled these in my George Foreman grill machine. I took the roasted cherry tomatoes [whole] and seasoned them with a little oil, salt, pepper, garlic powder, rosemary, and basil. Roasted these in a 350 degree oven for about 15 minutes, I’d say? Just until right before they were ready to burst. Juicy and delicious!